A non-surgical, natural way to eliminate stubborn fat. CoolSculpting® is a revolutionary, non-surgical contouring treatment. 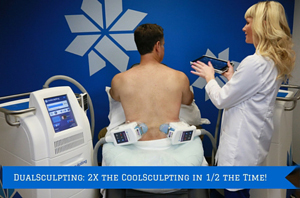 CoolSculpting® freezes stubborn fat, which is then naturally eliminated from your body. There is no need for needles, no special diets, no supplements, and no surgery. Most importantly, there is no downtime when you choose CoolSculpting®. DualSculpting allows you to freeze twice the fat in half the time. 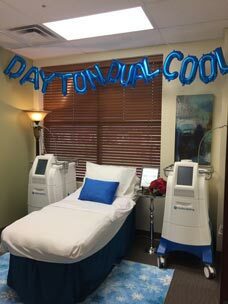 We’re the first practice in Dayton to perform CoolSculpting treatments and we’ve completed more CoolSculpting than any other practice in Dayton. CoolSculpting® Say goodbye to muffin tops and love handles. CoolSculpting® is the most innovative, non-surgical way to lose stubborn fat. This revolutionary technology targets and cools unwanted fat cells to prompt a noticeable, natural-looking reduction in fat bulges. Schedule your consultation today to find out if CoolSculpting® is right for you. Unlike many other methods of fat reduction, CoolSculpting® involves no needles, surgery, or inconvenient downtime. 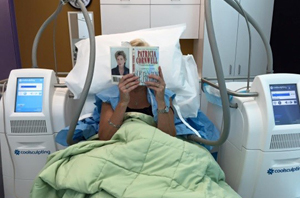 Patients often spend their procedure time reading, working on their laptops, or simply relaxing. CoolSculpting® is safe, effective and approved by the FDA. Results look completely natural and can be seen as early as three weeks. The most dramatic results occur from one to three months. To initiate the treatment we will position the device on your body. The device will then draw the bulge up between two cooling panels. An hour or so later, depending on your needs, you’re done. Yes. CoolSculpting® is completely non-surgical. Some patients experience redness, minor bruising, tingling, numbness or discomfort in the treated area, though this is temporary and will resolve completely. Patients often return to work after the session. You may start to see changes as quickly as three weeks after your treatment. You will experience the most dramatic results from one to three months after your treatment because your body is still flushing fat cells (and will continue to do so for about four to six months after treatment). Yes. During CoolSculpting®, the treated fat cells are eliminated. As long as you maintain a healthy lifestyle, long-term results should remain stable. Call us today to set up your consultation. We’ll see if you are a good candidate for CoolSculpting®. If you qualify, we’ll work with you to develop a treatment plan. Ready to say goodbye to your chin, muffin top, and love handles? Cova Ob/Gyn and Cova MedSpa offer the complete womens practice incorporating obstetric and gynecologic care with physician directed aesthetic services. 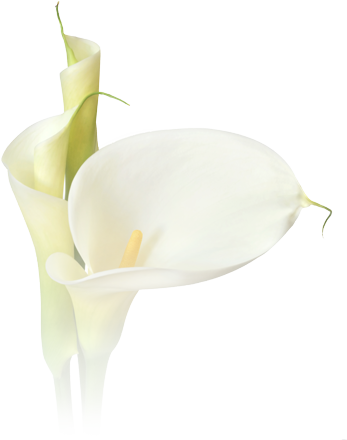 We are the comprehensive center for your well being..